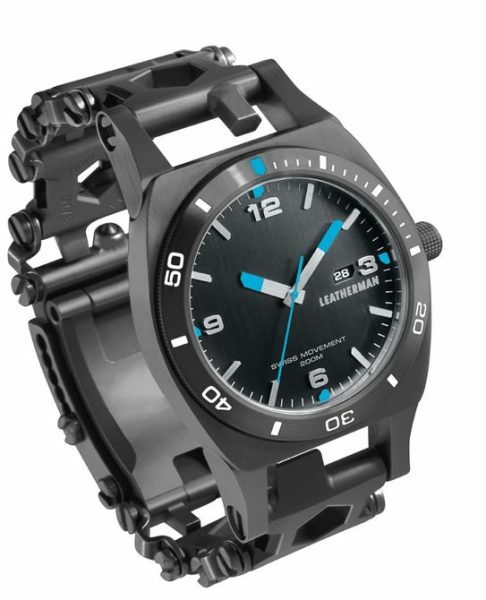 Leatherman has finally added a watch to the Tread Bracelet called the Tempo. It is a Swiss-made quartz movement with diver’s bezel, glow-in-the-dark hour markers and hands (stainless only), and a shock resistant sapphire crystal. It is water resistant to 200m. It will retail for $575 and be available in November. Leatherman has also announced the Tread LT which is 20% narrower and 10% lighter than the original. The tools will be a 3/32″ Screwdriver, Cutting Hook, 6mm Hex Drive, 4mm Hex Drive, 8mm Box Wrench, #3 Square Drive, #1 Square Drive, Pozi-Driv #2 and 11mm Box Wrench. It is also TSA-friendly and comes in stainless steel and black. Prices will start at $175. Visit Leatherman for more info. $575 The holy hell’o? I started reading this, though to myself. I might actually get one for when I’m spending lots of time outside in mountains and my pebble (I still love my pebbles) arn’t really useful. But at that price? $575 + ~$200 for tool? Umm. Guys I got my last pebble color round for $65 on an amazon liquidation. Ouch. I think the $575 will be for the whole watch including the bracelet.